Corning, Arkansas’ Annual City-Wide Yard Sale will be held on Friday, May 3rd, and Saturday, May 4th. 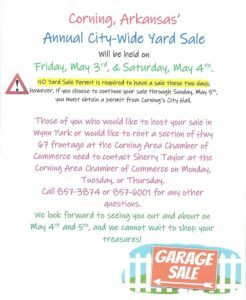 NO Yard Sale Permit will be required for May 3rd and May 4th; however, if you choose to continue your sale through Sunday, May 5th, you must obtain a permit from Corning’s City Hall. Those who are interested in hosting a sale in Wynn Park or would like to rent a section of Hwy 67 frontage at the Corning Area Chamber of Commerce need to contact Sherry Taylor at the Corning Area Chamber of Commerce on Monday, Tuesday, or Thursday. Call (870) 857-3874 or (870) 857-6001 for other questions. We look forward to seeing you out and about on May 4th and 5th, and we cannot wait to shop your treasures!